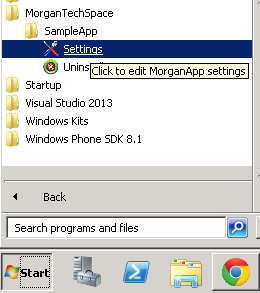 By MSI setup, you can easily create Start Menu Shortcut for your application. But when it comes to custom installer setup, we need to write custom code to create All Programs shortcut. In C#, you can create shortcut using Windows Script Host library. In this article, I am going write C# code examples to create Start Menu (All Programs) shortcut for Current User and All Users profile. The below C# method creates Start Menu >All Programs shortcuts to open Application settings UI and Uninstall setup shortcut. The function call of Environment.GetFolderPath gives current user's profile path, so the created shortcuts will be available only in current user's Start Menu (All Programs) location. You can get common profile path for All Users by using API function SHGetSpecialFolderPath. The below C# method creates All Programs shortcut, since the function call of SHGetSpecialFolderPath returns common profile path for All Users, so the created shortcuts will be available in all user's Start Menu (All Programs) location. The below C# method deletes start menu shortcuts from both current user profile and all user's common profile.